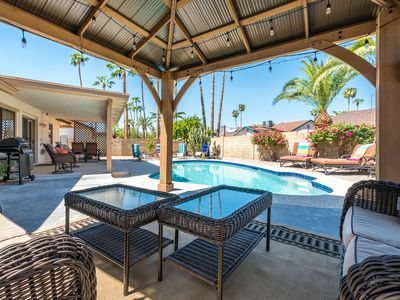 Make your Chandler trip an unforgettable one by staying at this 4-bed, 2-bath vacation rental home! 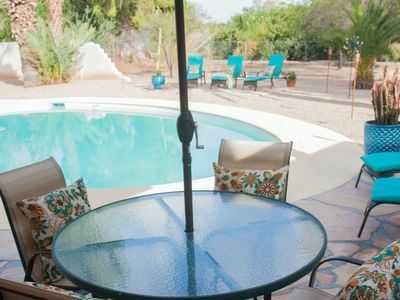 With upgraded flooring, brand new appliances, and designer furnishings, plus a private pool and yard, this property is the perfect place for groups of 8 and friendly Fidos to relax. 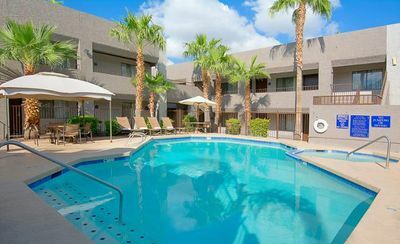 Located in west Chandler, the home is within minutes of the Lone Butte Casino, Chandler Fashion Center, and South Mountain Park! 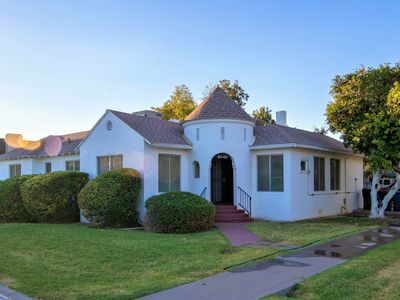 Additionally, you'll be just 25 minutes from the hustle and bustle of Phoenix! 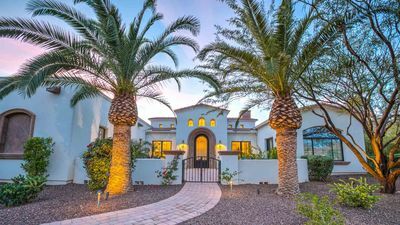 Pull up to this charming getaway to find a contemporary exterior surrounded by palm trees and vibrant greenery. 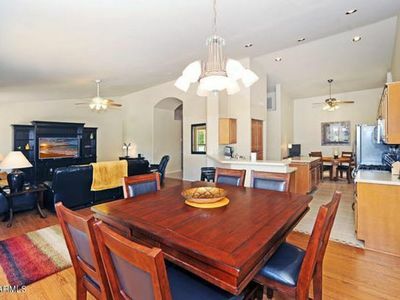 Inside, you'll discover a freshly painted interior outfitted with upgraded fans, lighting fixtures, and sleek flooring. Each door and window has shutters, offering privacy to you and your guests during your stay. The front sitting room is the ideal spot for an afternoon snooze, while the living room will become the favorite hangout spot after your daily outing. 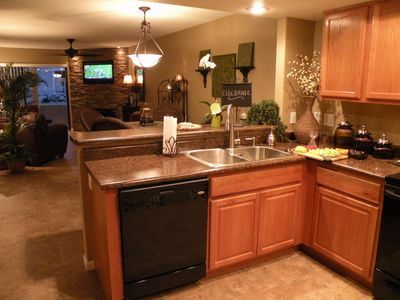 With high-end furnishings and a flat-screen cable TV, you'll feel right at home while watching your favorite shows! 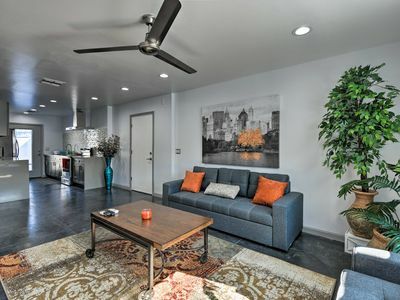 Neighboring the living room is the pristine fully equipped kitchen, complete with granite countertops and new stainless steel appliances! After concocting a culinary masterpiece, convene at the 4-person table or the formal dining area with a new 8-person dining set. 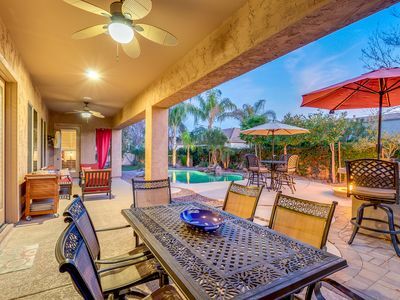 On nice days, fire up the gas grill while the kids splash around in the private pool! The backyard is fenced-in and includes lounge seating and patio furniture for meals al fresco. 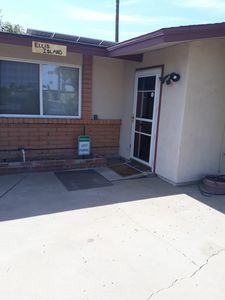 When you retire for the night, take solace in the master bedroom featuring a plush king bed, flat-screen cable TV, and walk-in closet with a safe. You're sure to adore the spacious en-suite bathroom, elevated with a huge walk-in shower which has 6 body sprayers, 2 handheld showerheads, and a built-in seat. There's even a separate jetted tub and double vanity! Other guests can rinse off in the newly renovated second bathroom before bed, housing an oversized shower/tub combo. Each additional bedroom offers soft linens and cloud-like mattresses, ensuring a peaceful slumber for everyone. 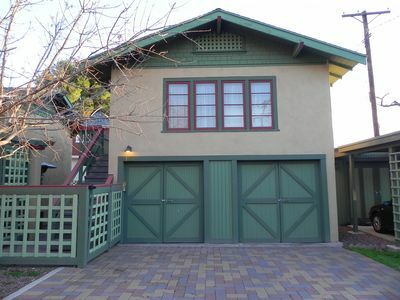 This home's fantastic location places you close to an array of beautiful nature parks! 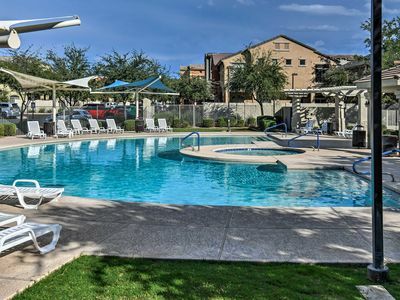 Grab a breath of fresh air by exploring Desert Breeze Park, Veterans Oasis Park, or South Mountain Park. If you're feeling lucky, hit the slots of Lone Butte Casino or Wild Horse Pass Casino, both within 15 minutes of the home. For more family-friendly activities, go shopping at the Chandler Fashion Center, catch a flick and the Harkins Theatre, or visit the Arizona Railway Museum! A day on the links is never far away with Ken McDonald Golf Course and Raven Golf Club within an easy drive. Those seeking a little more adventure can book a horseback riding tour, take a hot air balloon ride, or go rock climbing in the desert! 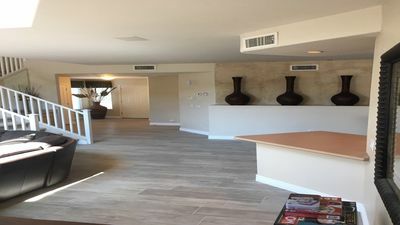 - Amenities include a fully equipped kitchen, 2 flat-screen cable TVs, free WiFi, central heating and air conditioning, linens, towels, complimentary toiletries, in-unit laundry machines, a gas grill, patio furniture, beach towels, a private pool, garage and driveway parking, and more! 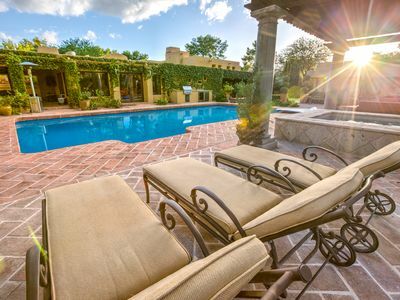 AZHOLIDAYRENTAL Exclusive Luxury Scottsdale Villa! 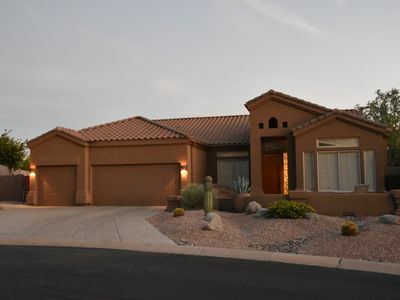 Beautiful home on popular Red Mountain Ranch Golf Course with AMAZING views! 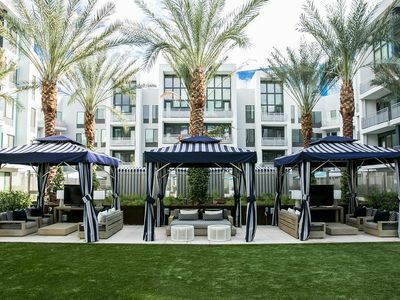 Blue Chill ★ Luxury in Scottsdale ★ BEST Location! JUST ADDED! Perfect for large groups! Rooftop Views of Camelback! Luxury Villa!